The print version of Take Five is sold out. The E-book version is available from Amazon for $15.00. Take Five: The Public and Private Lives of Paul Desmond is the story of a jazz artist who transcended genres to establish one of the most immediately recognizable sounds in all of music. Long before his success as the alto saxophonist with the Dave Brubeck Quartet, decades before he wrote "Take Five," Desmond determined that he would be himself, never a disciple or an imitator, whatever the cost. "This is the book Doug Ramsey was born to write: a love letter from one friend to another; an appreciation by a gifted critic for a great artist; a biography of a man who so methodically compartmentalized his music, life, and loves (many loves) that only a dedicated detective could tie up the strands; and a history of a recent yet largely vanished musical era. The telling is lyrical, funny, nostalgic, provocative, and allusive — just like a Paul Desmond solo." The only son of a doting musical father and an emotionally troubled mother, as a young boy in San Francisco he was separated from his parents and sent to live for years with relatives 3000 miles away. Desmond came out of the Army after World War Two to struggle with uncertainty and indecision as he developed his individuality against the prevailing jazz winds of the day. He eventually became a friend and admirer of the bebop genius Charlie Parker, but early on he swore that he would never be just another horn in the crowd of Parker acolytes. Desmond was torn for a time between a career as a writer and one as a musician. Though he never abandoned his gift for writing, music won, and he concentrated on clarinet, then the saxophone. He worked in dance bands and dixieland groups, entertained in amusement parks and resorts. He took whatever work he could get as a player. "When I learned that Doug Ramsey was writing a biography of Paul Desmond, I was pleased and relieved, because I can think of no one better qualified to do so. Ramsey has the distinct advantage of being a musician, someone who understands how a jazz musician thinks and how amazing Paul’s talent really was…"
In 1947, Desmond and Brubeck discovered that, despite their stylistic differences, they had an uncanny musical empathy. Finally, in 1951 they formed the Quartet. After three years of travail and near poverty, the band became one of the most successful jazz groups in history and Desmond one of the music's most celebrated figures. The classic Dave Brubeck Quartet with Desmond, bassist Eugene Wright and drummer Joe Morello traveled the world, won polls, sold records in the hundreds of thousands, opened a market for jazz concerts on college campuses and became the only jazz band since the Swing Era to be a fixture in popular music. With the immense success of Desmond's "Take Five," the Brubeck Quartet became the first million-selling jazz group. "Doug Ramsey's Take Five is an invaluable addition to jazz literature—by an especially enduring writer on the music. I knew Paul Desmond, but I found so much more I did not know." Casual, urbane, an intellectual noted for his wit, he married for a short time, then for the rest of his life remained single and immensely attractive to women. He had many acquaintances but few intimate friends, and he went to lengths to keep his close relationships in separate compartments. Desmond never conquered his basic shyness or the lack of confidence that made him a lonely man in spite of his success and acclaim. "This is a fascinating portrait of a remarkable artist who turns out to have been not at all easy to know. It is a rare and valuable book largely because Doug Ramsey (who began with the advantage of having known Desmond about as well as anyone ever did) has approached his subject with skill, sensitivity and — above all — the ability to thoroughly involve himself in the project. When Ramsey lets us share his conversations with people who played important roles in Paul's life, it is as if we were there with them, not just reading, but listening and learning." Long before he became a leading jazz critic, Doug Ramsey met Desmond, became his friend and remained close for more than twenty years. They shared many interests in addition to music and spent hours at a time in a conversation that continued until shortly before Desmond died in 1977. Preparing to write Paul's story, Ramsey marshaled his skills as a veteran print and broadcast journalist. He interviewed scores of people from all periods of Desmond's life, grade school through his lonely final days. He talked with women who were romantically involved with Paul, Gloria Steinem among them. He discovered a cache of correspondence and documents that helped disclose the hidden story of Paul's early years. After a long search, he found Duane, Paul's former wife and intellectual sparring partner, who remained Desmond's friend long after they parted but was a figure of mystery even to Brubeck and other colleagues. He talked with leading musicians who were contemporaries, and combed through dozens of publications for reviews, articles and interviews. As Ramsey did his work, Desmond the private man with great joys and great troubles began to emerge from the shadows to fill out the public image of a blithely self-contained star soloist spinning out seamlessly inventive musical stories. "The detail of the research is astonishing. The writing is exquisite. I've never seen a biography like it." "In all of those interviews, all of that research," Ramsey says, "I found only one person who had anything negative to say about Desmond, personally or musically. Paul had the remarkable ability to hold himself extremely close, guarding against true intimacy with all but a select few while gaining the respect and love of virtually everyone who came in contact with him." "Doug Ramsey has illuminated Paul Desmond's life and music with insight and compassion, gleaned from diligent research and genuine friendship, and offered with the touch of a true storyteller. This is the finest biography we've had of an important jazz figure." 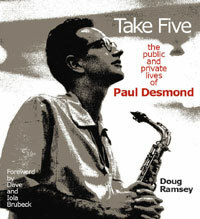 Take Five: The Public and Private Lives of Paul Desmond includes long, revealing passages from Paul's letters, hilarious accounts of life in the army and life on the road, his memos to himself about his artistic choices and his disagreements with jazz orthodoxy, his carefully crafted campaign to persuade Brubeck that he should be in Dave's band. Many of the book's nearly two hundred photographs have never before been published, nor have several amusing drawings by Desmond's close friend Arnold Roth. Ramsey includes the story of how Brubeck's friendship with Desmond blew up and Brubeck's wry account of how Desmond repaired it. Dave and Iola Brubeck wrote the book's foreword. It begins, "Paul Desmond was an enigma." This fascinating book makes him less of one. Take Five also includes transcriptions of several of Paul’s most brilliant recorded solos, with comments and analysis by such noted artists as Bud Shank, Bill Mays, Paul Cohen, John Handy, Gary Foster and Brent Jensen. They provide a graphic illustration and explanation of Desmond’s timeless and lyrical style. The E-book version is available from Amazon for only $15.00.